"Wherever you are from, Belushi's lives to throw epic parties, serving up beers, bombs and burgers with a relentless rock 'n' roll attitude and the playlist to match. For all you sport fans out there who are looking for the best bar to watch International live sports in your city? Look no further than Belushi's sports bars! As the home of international sport, Belushi's will be buzzing as we show every game - live on our big screens TVs. With us you have a guaranteed front row view of all the action and food to boot! Some of our big picks, to name a few: Barclay's Premier League, Champions League, FA Cup, Championship, League Cup, La Liga, Bundesliga, Rugby Union, Super League, NFL, NRL, AFL, Boxing, Tennis, Cricket and all American sports. 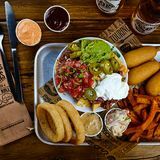 With a great range of international beers and spirits, plus a full bar menu serving epic burgers, and bar snacks, Belushi's is without a doubt the best place to watch your favourite live sports." Heated patio and BBQ area. Belushi's is basically a backpackers joint. If you think you stand a chance of introducing a few dutchies to english culture (i.e. scoring), Belushi's may be worth your while. 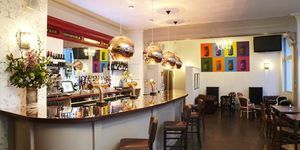 I popped into Belushis Hammersmith yesterday before a meeting, it's a really cool venue right opposite the tube station. It's quite a big space and it was light and airy - just what I needed on a really humid day. They have loads of screens to show sport and I chatted to the duty manager Simon, a really friendly, helpful guy who clearly knew his sport. I didn't have time to eat, but the food I saw coming out looked great. Will definitely come back to watch the football on one of the big screens and try the food. I was here the other week for a game of football by boyfriend and friends went to watch - not expecting much but the atmosphere was great - there were loads of people watching the game and the drinks offers were amazing. I also had a super yummy burger with bacon and bbq sauce. Apparently its an Aussie hangout and they have some great parties during the week! Recommend to anyone looking for some good food and great drinks! Quite a bad experience after the staff tried to cheat on us not giving the right change (Instead of giving back £15 we got only £5) and showing silly faces after we complained. The manager's phrase 'I don't like your attitude' as we were getting upset was really not correct. After all, the burgers were burnt and the prices were way too high for this kind of place - to tell the truth, I quite liked the atmosphere in the beginning but I'm never going back there..
Belushi’s Shepherd’s Bush is a no-frills, sports-loving bar that attracts a happy, party-orientated crowd. Step inside and the first thing you notice is the mass of colour everywhere – from the pop art-esque icons on the walls, including Audrey Hepburn and Muhammad Ali, to the flags of different nations on the ceiling. If you manage to grab a booth, you’ll be treated to your very own mini-flat screen TV, but if you’re not so lucky, two plasma flat screen TVs show all the action as well. Sturdy dark wooden tables and comfy soft leather chairs make this an easy place to hang out and a modest outdoor seating area can be found at the front, although you are on the incredibly busy Shepherd’s Bush roundabout so it’s not the most pleasant view. With loud 80s rock and pop playing in the background during the early evening, it’s definitely a place for those who want to let loose after a hard day at work. Staff are happy to help and you can expect to find a mix of people – young groups of friends, work mates unwinding and older men who just want a good pint – all with one thing in common: they’re up for a good time. The sharing platter (£9.95) has a little bit of most things from the starter menu but it’s a shame that the quality is not the best. The garlic bread is strong with flavour but the soggy bread soaked in oil makes it rather off-putting; the BBQ chicken wings have a sticky coating but the meat itself is dry; and the onion rings are sweet and crisp but, again, greasy. On a brighter note, the nachos and dips are moreish. With a decent reputation for burgers, Belushi’s doesn’t disappoint on this front. The mushroom blue chicken burger (£8.90) is filled with a whole portobello mushroom, stilton and salad, with a dash of red onion marmalade, which all come together wonderfully – though a little more stilton wouldn’t go amiss. 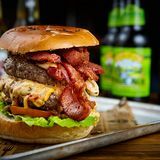 The Barcelona beef burger (£8.70) is piled high with its juicy thick patty clearly made from good quality mince. 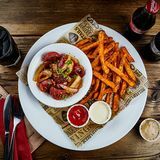 The thin slices of chorizo add enough smokiness and depth to the burger which is complimented by the salsa. All burgers are served in soft white floury baps along with a small bowl of chunky chips and a bog-standard salad. For dessert, the key lime pie (£3.95) has a crumbly base and a real citrusy tang which is countered by the sweet meringue topping. The New York cheesecake (£4.25), however, is disappointing with its heavy filling and warm biscuit base. Although cocktails take most of the space on the drinks menu, the Monte Verde Cabernet Sauvignon (£13.50 bottle) isn’t a bad choice to drink on its own or with a meal – it’s easy to drink and full of fruity notes. 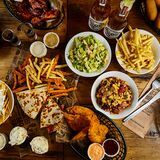 Belushi’s Shepherd’s Bush is full of buzzing, chatty people, which makes for a lively the atmosphere and, although the food could be improved, the reasonable prices and the extensive range of drinks mean it’s a popular spot.